Ok, so we’re going to go ahead and just call this Cloudy 2, Meatballs 2, or even Cloudy Balls 2, depending on how the mood takes me. I’m not been on acronyms such as CWACOM2 or CWACOM2:ROTL. It sounds like I’m having a seizure or choking on something – probably a cunningly disguised tomato or some such nonsense. 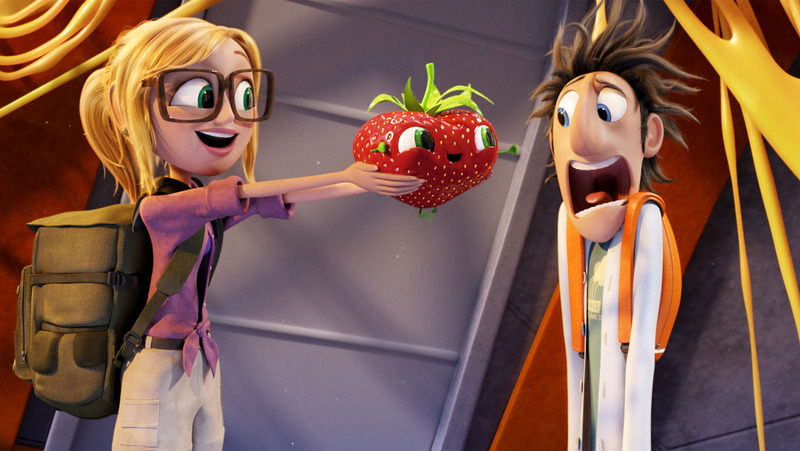 So, for those not familiar with the original Cloudy with a Chance of Meatballs, the premise is that a young, plucky scientist called Flint Lockwood (Bill Hader) invents a machine that can convert water into food. Not just any food, but super delicious food. This all goes a bit awry when the food starts going crazy and attacking residents. This is coupled with crazy meteorological (meAteorological? Ha) phenomena involving food too. Ultimately, Flint, with his Dad (James Caan) friends Sam Sparks (Anna Farris), Brent McHale (Andy Samberg), Manny (Bemjamin Bratt) and his monkey Steve (Neil Patrick Harris) save the world by shutting down this machine. Yes, this is a silly plot. Hell, the film is about animated food objects… it’s hardly going to be competing for Oscars’ glory against Captain Phillips is it? But that’s not the point. 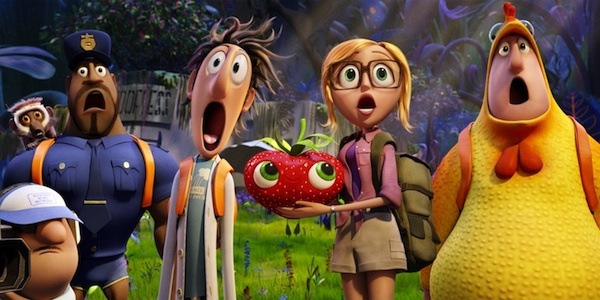 Clearly, Cloudy Balls 2 is geared towards kids – it’s an animated movie that’s high on colour and high on ludicrous accents. But one thing it does bring with aplomb is whimsy, cuteness and an array of food-based puns. So if this isn’t what you look for for entertainment, it’s probably not going to whet your appetite and have you salivating for more! Indeed, this cuteness even touched the icy rock that is The Phage‘s heart… Yes, I audibly went “awww” after an out-of-hand insult against an animated tomato. Yes, it’s as ludicrous as it sounds. And yes, I don’t even like tomatoes, but it was quite adorable. Scratch that – very adorable. As is obvious, this film is directed at the kids. In that regard, it will inevitably succeed as it’s ludicrous and colourful enough to sate many young viewers. But for the rest of us? Well… there was an element of drag towards the end of the first act / beginning of the second. It all seemed like it was taking too much time up. I actually found myself feeling slightly sleepy about 30 minutes in. Now, sleep has only been achieved during The Muppets in recent memory. But… I didn’t fall asleep. This is good news, as the film certainly then re-gathered pace towards the end. 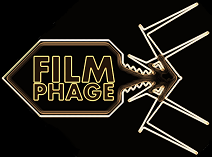 As is customary at Film Phage, I won’t score people on “acting”, as it’s purely voiceover work. The animation is probably more worthy of mention here. Whilst it’s certainly pretty, I’ve always felt that the style used for Cloudy and Cloudy 2 looks… well… cheap. It’s not as lush as what’s churned out by Dreamworks and Pixar. I guess this is a quirk of the film, but it is a little jarring. I guess I’ve been spoiled in terms of animation quality in recent years… but it doesn’t detract from the success of the film. Cloudy Meat 2 definitely doesn’t leave a rancid taste in the mouth like that disgusting red devil-fruit. No, I’d compare the film more to a waffle – a plain waffle. That initial bite is great… sure, the taste kinda gets a bit samey after a while, and you might get a bit bored… but towards the end, you begin to relish that sweet taste in your mouth and don’t want it to end! Maybe you should add some more chocolate to this film… just to give it that edge! This entry was posted in Review and tagged Andy Samberg, Anna Farris, Bill Hader, Cloudy 2, Cloudy Meatballs 2, Cloudy with a Chance of Meatballs, Cloudy with a Chance of Meatballs 2, food film, food weather, foodimals, inventor, Meatballs 2, Steve the Monkey. Bookmark the permalink. The first one was bearable but I’m not sure I can manage another, even for Steve!